Thunder Bay Press, 9781626865235, 256pp. "Food is the essence of existence." "Vannakkam" is a Tamil saying meaning "welcome," and that's just what this beautiful cookbook does—it welcomes you to a finer level of Indian cuisine. 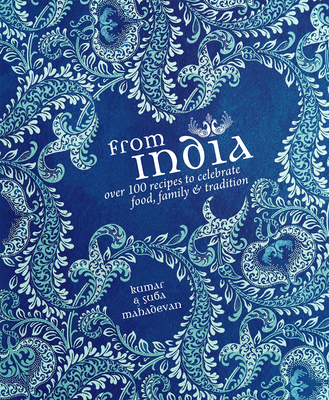 Kumar Mahadevan, the talented chef behind Australia's iconic restaurants Abhi's and Aki's, weaves over 100 recipes with the unique tale of his family's journey from India to Australia. A spicy blend of contemporary food and authentic cooking, From India covers seafood dishes such as rava methi machi, vegetarian sides such as gutti venkai koora, and a full lineup of traditional curries, organized according to the tastes: salty, bitter, sour, spicy, and sweet. This flavorful trip, with roots in Ayurvedic principles, will take you from the regional fare of India to the streets of Australia without ever leaving your own kitchen. Kumar Mahadevan trained as a chef in Madras and later worked at Bombay's Taj Mahal hotel. He worked in war-torn Iraq before moving to Australia. Kumar and his wife, Suba Mahadaven, opened their first restaurant, Abhi's, in Sydney in 1987 and their second, Aki's, in 2003.